This was a cruise organised at short notice. I saw how the weather had improved today and realised that we were experiencing Spring Tides and that low water would be very low today. The meant that we could pass under the Bure Bridges well before Low Water in Great Yarmouth, which was in the afternoon, and so could stem the tide for safely navigating under the bridges early on the tide. 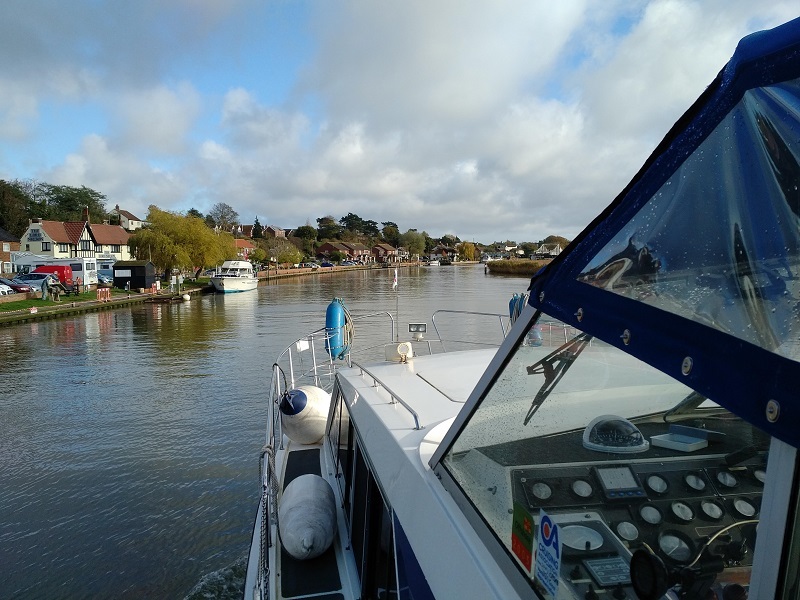 The remainder of daylight hours would also allow our passage up to Horning and so the decision was made. I dressed quickly and set off with Max, walking him along the Crabbett’s Marsh wood chippings road and then feeding him and loading him, and his accessories, into the old Range Rover. Then to gather my things together, opting against washing, shaving or anything else, so that I was very soon ready to go. Kathleen had been putting together foodstuffs and other essentials for our day out with the additional security of our meal for this evening should we have got delayed and stuck. Once loaded, I rushed us to Brundall and there put Kathleen aboard as I unloaded the car and transferred Max, his kennel and all of our things onto Lady Martina. After disconnecting the shore-power, I successfully started the engines, unmoored and we set off, Visibility through the misted-up bridge windscreens was a challenge but I was soon on the main river and heading downstream at a good pace; the ebb flow behind us. This strengthened the further down the Yare we got and we were lucky that Reedham Swing Bridge was open such that our progress was uninterrupted and aided by a tide of up to 2kn at times. As we cruised across Breydon Water I used the space and time to engage the auto-pilot as Kathleen and I removed all of the canopy sections, the winch and the ensign flag staff and then lowered the mast and, after this, the side and forward windscreens such that we were right ready to approach the Bure Bridges. We had about 9ins to spare, even an hour-and-a-half before the 14.45 low water as the tide was due to sink to only .5m above LAT today. This left us cruising against the strong tide up the lower Bure as we punched the flood tide. 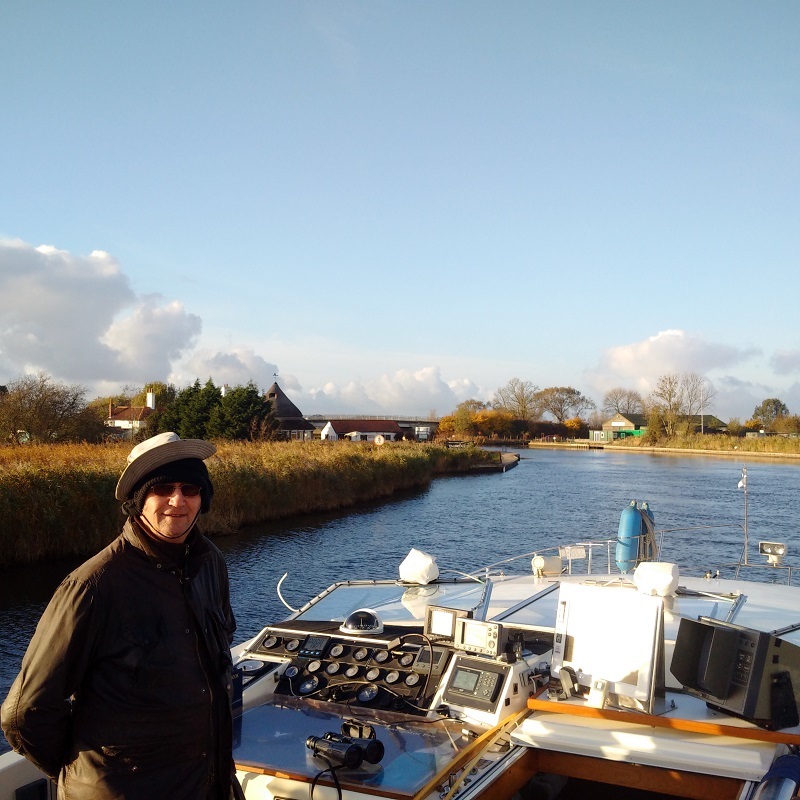 I sat up on the bridge with no windscreens or covers for around two hours until we had negotiated Acle Bridge after which we could tie up briefly and then put up the windscreens and the mast to provide some shelter. We cruised on like that as the sun was setting but we just manage to arrive at Horning before dark and could then unload and put Lady Martina to bed. Instead of putting our new covers back on, Kathleen fetched the older ones from the loft and we fitted those instead for the winter, carefully laying out our best ones in the garage to dry prior to cleaning, treatement and safe storage until the Spring.